Funny how my birthday is on May 11th (I’m 30!) and I ended up at Eleven Madison Park 11 Madison Avenue, New York, NY 10010. Perhaps this should be a birthday tradition. Yes, as long as James Beard Award winning chef, Daniel Humm, is behind the scenes this is perhaps the most perfect lunch in NYC. Amy, who is practically my sister now, treated me to this special lunch. I chose it because the $28 Two-Course is an incredible steal. Two courses doesn’t sound like that much, but add the gougeres, amuse, fresh breads, and macarons (all complimentary), and you will be full and smiling. 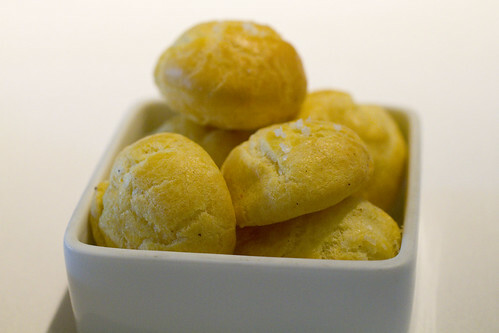 The warm gougeres are deceptively light and airy. I could pop these all day, and it’s dangerous as you browse the menu and mindlessly take one after the other. Shortly after menus are taken, the amuse arrive. 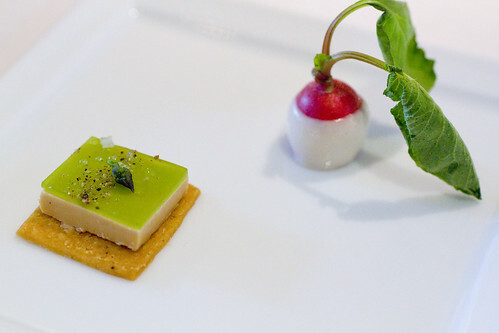 On one plate, an artfully designed cracker with foie gras sits with a baby radish. 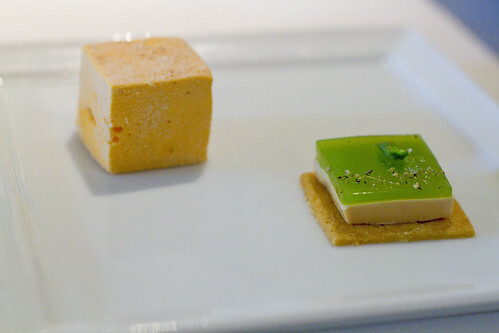 On the other, the same perfectly square bite and a carrot marshmallow. Each small bite was fun, a fleeting moment of joy, exactly what an amuse should be. Choosing 2 dishes out of 16 choices is quite difficult. Every one appealed to me, but our waiter was able to help us narrow it down, giving me his clear favorites. 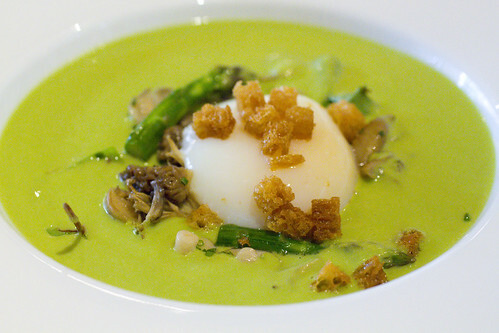 The first dish he mentioned was the Slow Cooked Knoll Krest Farm Egg with Asparagus Veloute. This is one of the best appetizers I’ve ever had (and we’ve talked about how appetizers are usually the winners so the bar is set high). I can go on and on about how the breadcrumbs contrasted the softest egg, how the mushrooms squish like a fine tuned orchestra, how the concentration of asparagus flavor surrounds but does not overpower, and how the whole feeling of it is perfectly velvety. 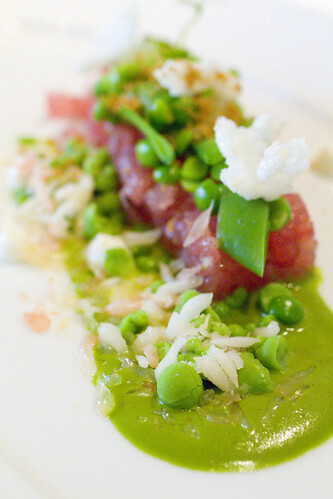 Amy started with the Big Eye Tuna Tartare with Sweet Peas, Mint, and Sheep’s Milk Yogurt. Every piece of this dish screamed fresh fresh fresh. This is the time of year to take advantage of all the fresh peas, snow peas, and sugar snap peas. 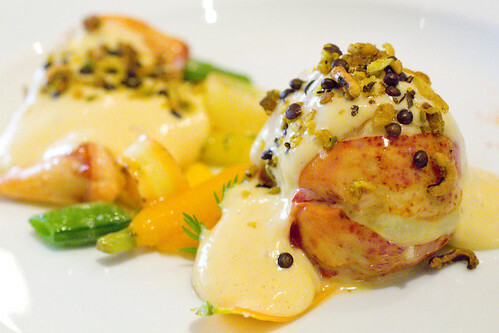 My second course, Poached Nova Scotia Lobster with Heirloom Carrots. A perfect tail, nuckle, and claw cloaked in a creamy yet airy sauce and topped with ginger and vadouvan granola. Generally, I like lobster plain, unadulterated, but every accompaniment here made this lobster even better. Amy had the St. Canut Farm Cochon de Lait (milk fed suckling pig). 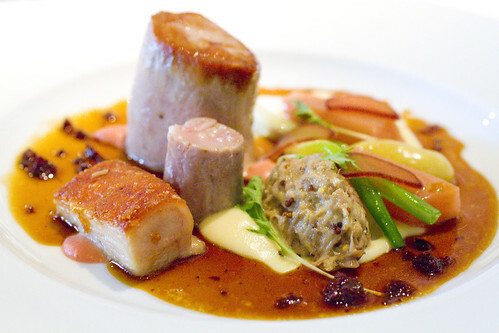 It’s practically architecture, with different cuts of the pig decorated with rhubarb, spring onion, and ice wine vinegar. The flavors were all wonderful but some pieces were a bit tougher than expected. I passed on dessert because I was truly stuffed. I forgot that wonderful restaurants like this always end with some sweets anyway so good thing I didn’t order more. Like all the “Happy Birthday” wishes I got from the staff, the plate had it written across as well, adding little touches here and there that made this a special lunch. It was impressive array of macaron flavors and colors (all without food coloring). One was a peanut butter and jelly macaron. Amy’s boyfriend Jason is PB&J obsessed so we asked if we could get one to take home. Our waiter brought us a pretty little box of six, topping off this wonderful experience. Everything was just so perfect. Thanks Amy! One of the best lunches ever! posted by jessica	at 12:12 PM	Filed under American and New American, Favorites, Restaurants. You can follow any responses to this entry through the RSS 2.0 feed. Both comments and pings are currently closed. Happy Birthday Jess!! I love all the fixed price lunches at amazing restaurants in the city. Will def need to check out this one! 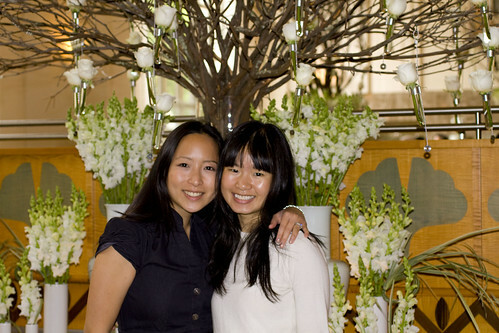 I have never gone to 11 Madison Park yet but it’s on my to-do dining list!! Happy belated birthday to you! Those gougeres are a fave. Looks like you had a beautiful birthday. Thanks everyone!! Every year, I am grateful for all of my wonderful friends! Andrea, me too! We’ll have to hit one together. Dolce, push it to the top of the list! I really need to check out this place. And yes, that is a steal! 🙂 Happy (belated) birthday! Eddie, I am plotting …. City Mitten and Grace, thank you for the birthday wishes!! These dishes look qo beautiful and exciting!! 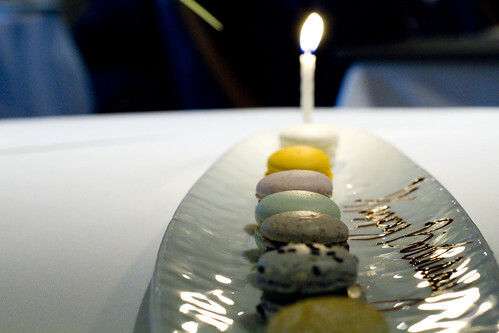 Happy belated birthday- this restaurant looks like such a fun treat to experience! happy belated! Next time in NYC, I’m totally doing EMP for lunch. What a bargain! Congrats on hitting 30. It’s all uphill from there. Until you’re 35. Then it’s all ouch. Thanks guys! Since I know the 3 of you are not in NY, you must make this a top choice for when you visit!! Mmmm can’t go wrong with gougere. I forget, have you tried the ones at Artisinal? Kasi, I haven’t! Blasphemy. I blame Lon.